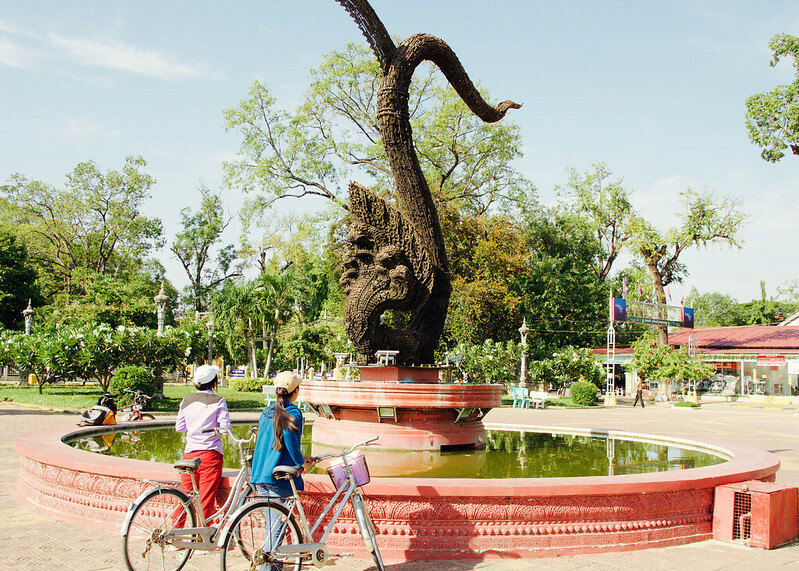 The Naga For Peace Statue in Battambang, Cambodia was designed by Mr. Ou Vaandy. He teaches art at Cambodia’s National Institute of Education in Phenom Phen. “The teeth are made from bayonets. The Khmer Rouge would stab people to save bullets. The rest of the Naga heads were made from cut up AK-47 machine guns,” says Mr. Vanndy. After the war, the Japanese government paid for a program to collect and destroy guns from former Khmer Rouge soldiers. The statue’s structure resembles a traditional Khmer harvesting sickle. This forms the “tail”. Then Mr. Vanndy added five Naga heads to represent the Cambodian people. It’s estimated that the Khmer Rouge murdered 2 million of their own Cambodian citizens – including Mr. Vanndy’s father, aunt and uncle.